We are focused on providing our customers with a fresh and healthy experience every time they enter our stores. We help to create healthy and thriving communities by supporting organizations that promote nutrition education and maintaining a healthy lifestyle through diet. More than 150 Shaw’s and Star Market locations across the New England area raised $250,877 to help free kids and adults from the harm of muscular dystrophy, ALS and related life-threatening diseases that limit strength and mobility during the annual MDA Shamrocks program to benefit the Muscular Dystrophy Association (MDA). Since first teaming up with MDA in 1994, Shaw’s and Star Market and its customers have raised over $3.7 million to help the organization provide the families it serves with critical resources and support to fulfill life goals. From February 19th to March 17th Shaw’s and Star Market locations participated in the nation’s largest St. Patrick’s Day fundraising program in which customers and employees purchased an MDA Shamrock at check-out for a $1, $5 or a larger contribution at check-out. Each Shamrock was signed by the customer and prominently displayed in each store, symbolizing strength, independence and life for MDA families in the community. The 2016 MDA Shamrocks program united tens of thousands of retail locations throughout the country to benefit the organization’s shared mission to find research breakthroughs across diseases; care for kids and adults from day one; and empower families with services and support in hometowns across America. Funds raised help provide life-enhancing programs such as state-of-the-art support groups and clinics, including 10 MDA Care Centers in Boston, Worcester, Springfield, Providence, Portland, ME, and Lebanon, NH. They also help send more than 150 local kids to “the best week of the year” at MDA Summer Camp at no cost to their families at Agassiz Village in Poland Maine and Channel 3 Camp in Andover CT. And, MDA also funds several million in medical and scientific research in the Greater Boston area with a goal of finding treatment and cures for neuromuscular disease. 2016 was a record breaking fundraising year for the Annual “Give a Smile” campaign that benefited the leading Children’s Hospital in the nation. The Company, employees and customers all came together and $500,000 was donated to Boston Children’s Hospital. The 2016 “Give a Smile” campaign ran from June, 1 through July 4. Through this annual fundraiser, Shaw’s and Star Market customers could contribute $1 or $5 at the checkout by purchasing “Give A Smile” icons in the amount of $1 or $5. Boston Children’s Hospital is home to the world’s largest research enterprise based at a pediatric medical center, where its discoveries have benefited both children and adults since 1869. More than 1,100 scientists, including seven members of the National Academy of Sciences, 11 members of the Institute of Medicine and 10 members of the Howard Hughes Medical Institute comprise Boston Children’s research community. Founded as a 20-bed hospital for children, Boston Children’s today is a 404-bed comprehensive center for pediatric and adolescent health care. 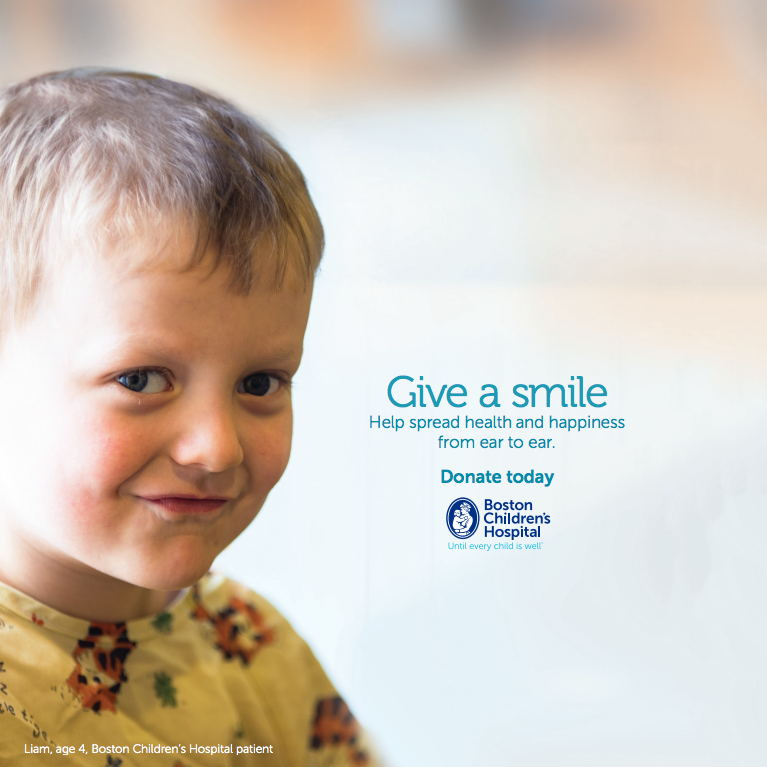 Boston Children’s is also the pediatric teaching affiliate of Harvard Medical School. For more, visit our Vector and Thriving blogs and follow us on our social media channels: @BostonChildrens, @BCH_Innovation, Facebook and YouTube.